Access a database by clicking the Database Home link (green). 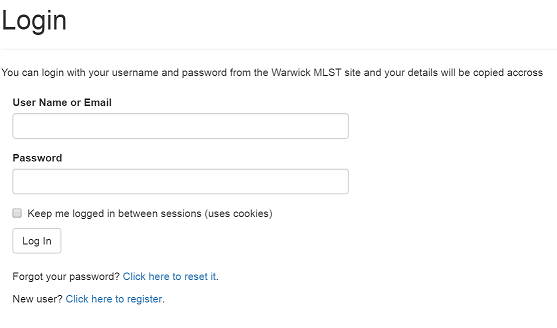 Access User account options, such as logging in (blue), registering a new account (red) and changing email/passwords are found in the top right. Anonymous user doesn’t have access to some important features such as downloading files (assembly and annotations files and save metadata to local files), creating GrapeTree and SNP projects and saving and sharing workspaces. So it is recommended to register and log in before starting to use EnteroBase. To Register on EnteroBase, visit the main webpage (http://enterobase.warwick.ac.uk) and click Register in the top right. This will direct you to the registration form where you should fill in a username, password, email and details about yourself. Once the form is filled, click Register. This will send a verification email to your specified email address. Click the link in this email to confirm your registration and you can then log into the EnteroBase website. 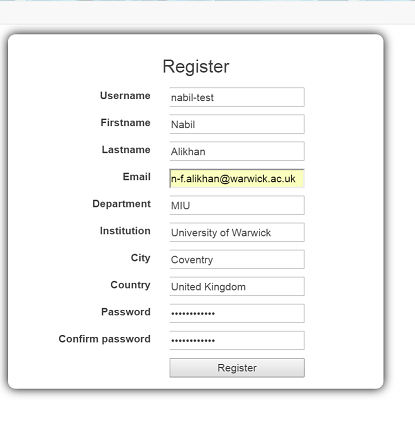 To Log into EnteroBase, visit the main webpage (http://enterobase.warwick.ac.uk) and click Login in the top right. This will direct you to the login page where you can enter your username and password. If you have not create an account or have forgotten your password there are links below to help you resolve this. Having created a login, the best way to get familiar with using the EnteroBase website is to look at some of the tutorials. Or if you like you can just start by trying to use the website, particularly if you have used similar websites in the past. © Copyright 2018, EnteroBase team Revision 7eb87ac8.